This page describes how to set-up your Yaesu FT-991(A) to work with fldigi. Whilst it is aimed at those using CentOS, many of the settings will work with Fedora, Ubuntu, SuSE, MacOS, and Microsoft Windows. Update January 2018: I have been running CentOS 7 for several months along with the latest version of fldigi from EPEL. At the time of writing the version is: 4.0.13-1. The set-up instructions below should work as a guide. You will need to install the Extra Packages for Linux (EPEL) repository in order to install fldigi on CentOS. For CentOS 7, simply enter sudo yum -y install epel-release in a terminal window. For CentOS 6, enter sudo rpm -ivh https://dl.fedoraproject.org/pub/epel/epel-release-latest-6.noarch.rpm in a terminal window. You can now install fldigi with sudo yum -y install fldigi. The install process will pull-in other dependencies, such as hamlib. At the time of writing the version of hamlib from EPEL does not include support for the FT-991(A). It is supported (as BETA) upstream in the latest version of Fedora. I have experimented rebuilding the hamlib library from rawhide for CentOS 7. The rebuilt RPMs are not fully tested and I can only hope that upstream changes filter down through EPEL. 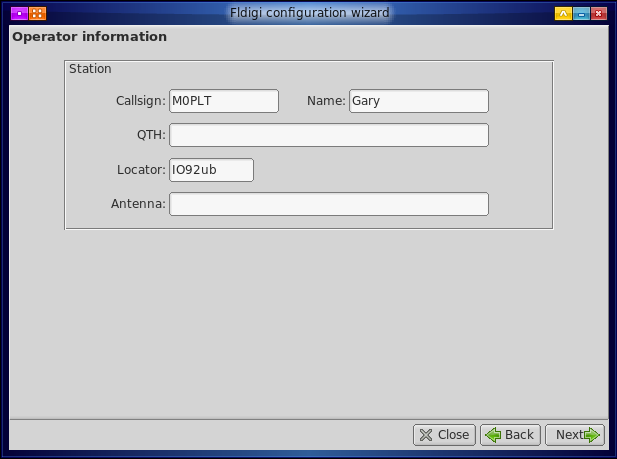 With fldigi installed, you can start the application and configure it for your station. Click Next on the first screen. Enter the details of your station, such as your call-sign, name, QTH, Maidenhead locator, and any aerial details you might want to list. Click Next. 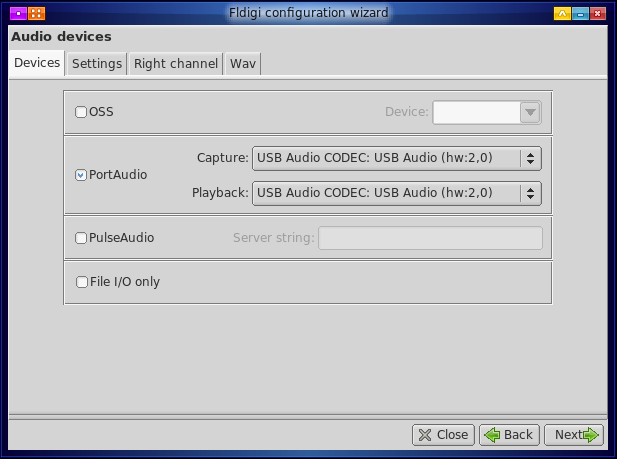 Tick the portaudio box and select the USB audio interface inside the FT-991(A) for capture and playback. Click Next. The lack of hamlib support for the FT-991(A) does not stop you using fldigi. 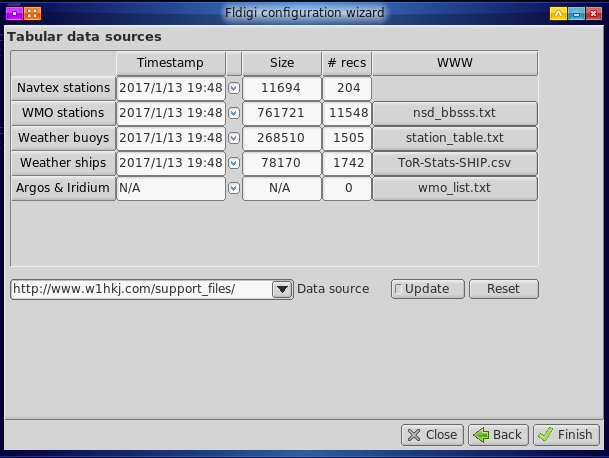 The very nice people at fldigi have made a RigCAT file to provide CAT controls for the radio. Browse to the Sourceforge site https://sourceforge.net/projects/fldigi/files/xmls/yaesu/ and download the FT-991.xml file to .fldigi/rigs. Click on the Rigcat tab, then the open button. The FT-991.xml file should be already visible. Select it and click OK. 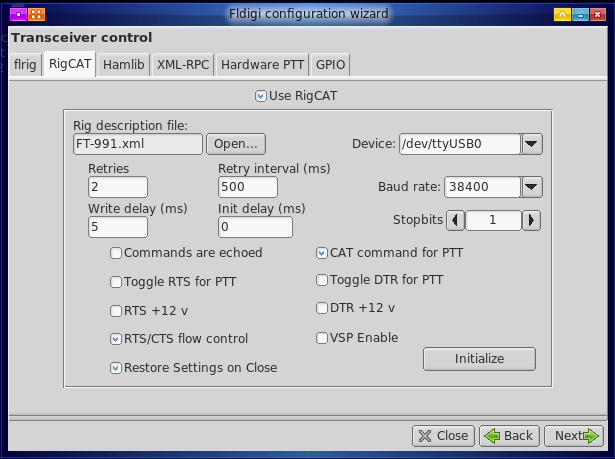 Tick to use RigCAT and set your controls as in the screenshot below. Remember to pull-down to use /dev/ttyUSB0. You will need to ensure your radio's menu 031 is set to 38400bps. In order to correctly use /dev/ttyUSB0, you should have followed the tips -link to page- on allowing your user ID to access the dialout group. Click the Initialize button to check that the software can talk to the radio. This requires power to the radio, but it does not have to be switched on. Click Next when you are happy. Click Finish and the full application will start. For the curios - the above screen shots are decorated with the Emerald Slatehorn_Blue theme. 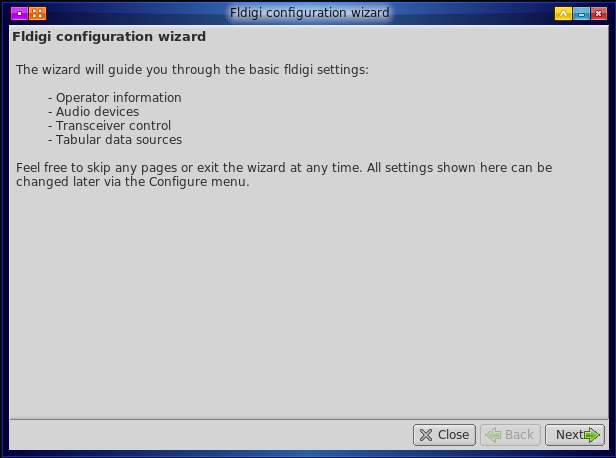 The following menu settings should allow you to use fldigi with your FT-991(A). Menu 062 (DATA MODE) when set to PSK, you should see around 2200Hz of audio bandwidth displayed in the waterfall in fldigi; although you will notice the sharp 18dB/octave roll-off above 2500Hz. If you do not, check the WIDTH setting as detailed below. This setting is not compatible with operating WSPR! Menu 064 and 065 may be set to 300Hz by errant software settings. The offset will mess with digi-modes and WSPR, so check they are both set to zero; and if you use programming software, check the settings are set to zero. Menu 070 selects for the Universal Serial Bus attached sound card. 071 uses the Data Terminal Ready line on the USB to RS-232 serial emulator to control switching between transmit and receive. 072 selects the Universal Serial Bus sound card as the audio source. Set the width to 3000! By default, the DATA mode selects a 500Hz width. To use fldigi correctly, you need to press the F (M-List) button, scroll through to the WIDTH button (next to the FWD button), press it, then use the multi knob to open it up to 3000Hz. You will hear a change in the received audio if you happen to be tuned to a digimode frequency. Press the LOCK button! Do not run the risk of going off frequency by leaving the VFO knob unlocked!! You can set frequencies and modes for easy recall by clicking on the 'open list' icon. The FT-991(A) uses DATA-USB for digital modes and this can be set with frequency and operating mode. The easiest way to set-up the list is to edit the frequencies2.txt file found in the .fldigi directory. If it does not exist, you can create one with a text editor. Here is my frequency2.txt list containing the DATA-USB settings and frequencies for IARU Region 1 data-modes. Feel free to copy and adjust as required. This is not an exhaustive list, however, I hope it serves as a guide to setting up DATA-USB and various digital modes. Drop me an email if you want to share your frequency list with others via my website. 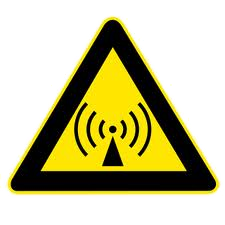 The highlighted frequencies can only be used if you hold a United Kingdom Full Amateur Radio licence. Radio stations outside of the UK should check their local licensing requirements for the 60 metre band. If you are new to digital modes, I would suggest you read through the fldigi help to get a feel for the software; and when you are ready to transmit, testing into a dummy-load is always a good idea!